Attempts have been made to cast doubt on Hemphill’s testimony using a remark he made in one interview, years later. When asked if the plane flew north of the Citgo service station he said “It’s hard to say”, then agreed that it might have passed over the station or a little north of it. As he was not standing at the same window when being interviewed it is not surprising that he was uncertain. In all his written statements and interviews, he contradicts the north path, stating that the plane was on his right and flew straight to the Pentagon, placing the path on the south. It is easy to see how he could have made this mistake as, shortly after the plane passes the service station, his view of it does in fact pass over its roof, but the plane does not. This can be seen in an animation available online. If we accept the testimony of these credible witnesses regarding the bank angle of the plane and note the wing loading required, the north path is seen to be both contrary to witness reports and physically impossible. The north path theory must have arisen from faulty recollection of something that would not have seemed important at the time. The only reasonable position to hold is that the plane flew on the south path, virtually straight. There is thus no case for denying impact and no need for explosives to do the observed damage. It follows that there is no need for the flyover theory, a theory which does not have a single witness to support it. No claim is made, however, that explosives were not used to augment the destruction. It is also important to note that proof of the south path and impact provides no support to other aspects of the official report, many of which are extremely suspicious. 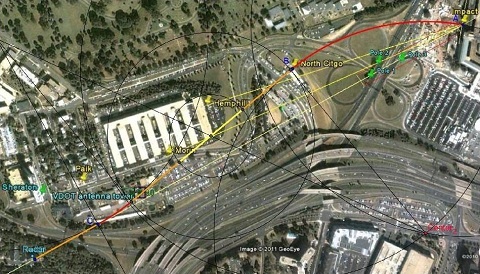 Revision of the calculations and witness testimony surrounding the flight path of the plane on approach to the Pentagon strengthens the previous conclusions set out in the original paper. Previously, the failure of the many witnesses to mention a steep bank was taken as proof that it did not happen, while the survival of the aircraft, if it deviated round the service station, was regarded as unlikely. With this new analysis of the witness testimony, showing the plane was flying wings level near the Naval Annex, survival of the plane is now found to be absolutely impossible. There is thus no rational explanation of the event other than that the plane flew virtually straight past the Naval Annex and the service station to the impact point. As calculation shows the flight path proposed by CIT to be impossible, the north path claim must be seen to be based on nothing more than a few faulty recollections of the approach path. Without the north path claim, the flight path is in accord with the path set out in the official account. There is thus no reason to doubt that the flight terminated by collision with the Pentagon, as reported by the majority of witnesses and as seen in the FDR file, where the low level approach and impact is recorded. The north path is refuted and must be abandoned. This removes the need for explosives to create the illusion of impact and also removes the need for the flyover theory. Nothing has been found to disprove the official description of the final seconds of the flight and the impact. Frank Legge and David Chandler, “The Pentagon Attack on 9/11: A Refutation of the Flyover Hypothesis Based on Analysis of the Flight Path,” Foreign Policy Journal, September 6, 2011, https://www.foreignpolicyjournal.com/2011/09/06/the-pentagon-attack-on-911/. Frank Legge and Warren Stutt, “Flight AA77 on 9/11: New FDR Analysis Supports the Official Flight Path Leading to Impact with the Pentagon,” Journal of 9/11 Studies, Vol. 30, January 2011, http://www.journalof911studies.com/volume/2010/Calibration%20of%20altimeter_92.pdf. Achimspok, who also studied bank angle, provides this image at the Pumpitout forum, http://s1.zetaboards.com/pumpitout/topic/3490445/7/. Pentagon witness spreadsheet (Excel file), http://sites.google.com/site/wtc7lies/PentWitnesses.xls; available from http://sites.google.com/site/wtc7lies/911pentagonflight77evidencesummary. Arabesque classifies witness statements, “9/11 and the Pentagon Attack: What Witnesses Described,” Arabesque: 9/11 Truth, April 2, 2007, http://arabesque911.blogspot.com/2007/04/911-and-pentagon-attack-what.html. “Volo UA 93 – Animazione NTSB,” Google Video, http://video.google.it/videoplay?docid=2289343926945551469 . “Volo 93 – Animazione NTSB (sintesi) 4a parte,” antibufala, YouTube, July 13, 2007, http://www.youtube.com/watch?v=Kq2T6xXRpMg. Ibid. Terry Morin, “Eyewitness Account of Pentagon Attack,” September 2001, http://remember911.albertarose.org/survivor_pentagonwitness.htm. “National Security Alert: 9/11 Pentagon Attack,” Video, Citizen Investigation Team, http://www.citizeninvestigationteam.com/nsa.htm. Legge and Chandler. Legge and Stutt. Eyewitness testimony of Deb Anlauf, “Eyewitnesses Accounts,” 9/11 Research, http://911research.wtc7.net/pentagon/evidence/witnesses/sgydk.html. Erik Larson, “Shinki and Ed Paik Accounts vs. CIT Methods,” 9/11 Reports, February 3, 2010, http://911reports.wordpress.com/2010/02/03/shinki-and-ed-paik-accounts-vs-cit-methods/. Interview of Albert Hemphill by Craig Ranke, May 24, 2010, http://www.citizeninvestigationteam.com/1/Albert-Hemphill-5-24-2010.mp3. Achimspok provides this animaged GIF image, http://i1210.photobucket.com/albums/cc402/gravity980/Hemphill-blue.gif. “Pentagon,” Science of 9/11, http://www.scienceof911.com.au/pentagon.